After twenty years of corporate experience, Ron Gardner started a training and consulting business in 1995. In 1997, he suffered a devastating and nearly fatal stroke that rendered him paralyzed on the right side and unable to speak. After recovering from his stroke, Ron continues to share his powerful and personal message of motivation and hope with individuals and corporations. His is a human interest story of triumph over tragedy that will be sure to inspire and help you and your loved ones as you face the mental, emotional, and social challenges of a life shattering event or serious illness. "This book will help you and help your family. Ron Gardner’s stories of experience and hope are just what you need when faced with an unexpected challenge. This book will move you from bitter to better." "Ron Gardner knows that a positive attitude goes a long way in helping the brain recover. Through his personal journey, he shares hopes and insights about how to maximize healing; not just of the individual who has experienced stroke, but of their familial connections." "Ron has been a true blessing to our lives. His positive outlook and determination are truly inspirational. Through reading his book, we know what he has gone through and how far he has progressed following his devastating stroke. His advice gave us insights and hope following Neil’s stroke. 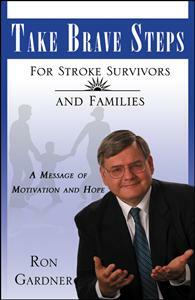 This book will show stroke survivors and families what can be accomplished. With hope, motivation, patience and hard work, stroke survivors and their loved ones can have a successful journey to recovery." "Take Brave Steps is a ‘must have’ for every stroke survivor and family member. This book is a perfect blend of wisdom and mind body medicine. I would recommend this reading to my stroke patients and their loved ones." Take Brave Steps for Stroke Survivors and Families is a ground breaking roadmap that leads survivors and loved ones through the mental, emotional and social maze of stroke recovery. Readers will be moved from bitter to better and find the fork in the road where motivation meets inspiration. With his heart-felt personal stories of motivation and hope, Ron Gardner, a survivor of a devastating stroke, guides readers how to navigate through the fears, adversities and challenges that often go unspoken and unanswered, until now…. This book is a must read for stroke survivors, family members, caregivers and heath care professionals. Order a copy of Take Brave Steps by Rod Gardner on buybooksontheweb.com.